Google’s share price has underperformed in recent years. Despite growing strongly, even through the credit crisis, investors appear to have misunderstood Google’s strategy and feared that competitors may steal a march on the search engine giant. Investors instead fell in love with Facebook and Apple, the latter probably completely justified given its enormous profitability. Many ‘experts’ did not understand why Google were giving away so much for free. I remember hearing a so-called industry analyst saying that Android was a waste of time as Google made no money from it. An extremely short-sighted analysis considering how many bright people build Google from a server housed in LEGO to the $200billion company it is today. Recent research has shown that Google’s Android OS has now achieved the majority market share of the current smartphone market. Just over 52% of smartphones run one version of Android or another and the speed at which it is growing its market share does not appear to be slowing down (see below). It is also worth mentioning that Google bought the 3rd biggest Android smartphone manufacturer, Motorola. Another move that most analysts didn’t follow. What Google is doing is ensuring that its core search business and future mobile business is protected by an extraordinarily large moat which its competitors are unlikely to ever cross. By controlling the Android OS, as well as the cloud on which their customers’ data resides (don’t forget Gmail, Google+, etc. ), Google cannot be easily usurped from the mobile sector. In fact, I would say that even if Apple spent their entire $80billion cash pile, or Microsoft their $100billion war chest, they’d still only reduce Google’s market share and not be able to eliminate it. While it could be years before Android truly pays off for Google (they are ‘only’ making around $1billion per year from it right now), it is invaluable to Google as a protective moat. When combined with current and future Google services (Google Music, Google+, Gmail, Google Docs, etc.) you can see that hundreds of millions of people will be using Google’s services for years if not decades to come. Getting people to switch away from something they are used to is far harder than winning over a new user. The next two years are critical for the major players (Apple, Samsung, HTC, Motorola, Google, Microsoft, Nokia & co). 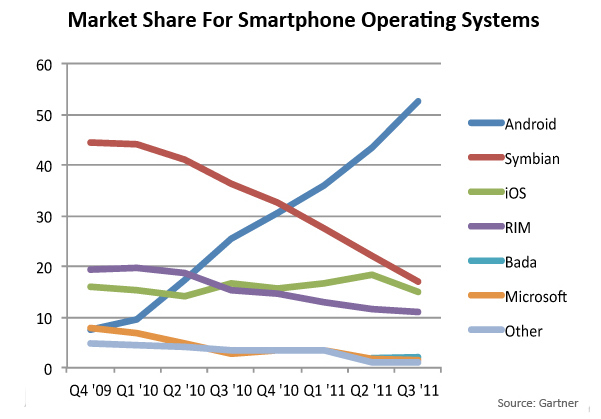 By 2014 the growth in smartphone sales will begin to slow down and plateau. After that point it will be far more difficult and expensive to grab market share away from the competition. Google’s moat is designed to persist.